This isn't proof, but uncanny resemblance. Multiple sources claim Daft Punk used the Digitech Bass Synth Wah the entirety of the album Human After All. "In addition to the [Bass Whammy](http://equipboard.com/items/digitech-bass-whammy), Alderete uses the [DigiTech DigiDelay](http://equipboard.com/items/digitech-digidelay) and Bass Synth Wah and 'a ton of DOD pedals.'" - [Source](http://digitech.com/en-US/news/racer-x-the-mars-volta-zavalaz-bassist-juan-alderete-digs-deep-with-digitech-bass-whammy). "I also love my effects. I have this DigiTech bass synth wah bass envelope filter. I used two of them - one for that left-handed Mini Moog sound, that low-end bass Moog - and then I use one that's more of a neutral wah, very sort of groovy. I used to use that kind of thing in 'Purple, like the California Jam [live album]. I like just a few effects like that." 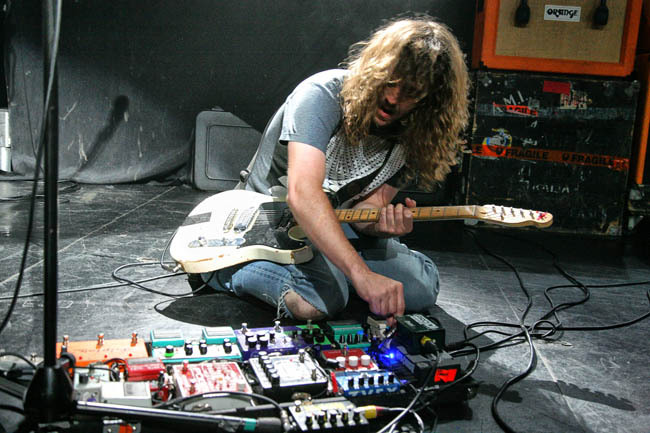 In this photo of Parsons fiddling with his pedalboard, one of the pedals visible is the DigiTech Bass Synth Wah. Like his bandmates, Stasik goes big on his pedalboard. His signal enters the board through a Boss TU-3 tuner, then hits a loop switcher controlling a Moogerfooger MF-1-1 Lowpass Filter (controlled by a Moog EP-3 expression pedal), 3Leaf Audio Wonderlove envelope filter and You’re Doom fuzz pedals, an Xotic effects Bass BB Preamp, a Boss OC-3 Super Octave, a DigiTech Bass Synth Wah, and an Electro-Harmonix Frequency Analyzer ring modulator. At 1:43, a Digitech Bass Synth Wah - Envelope Filter is shown. At 1:43 minute mark, Biale showed the Digitech Bass Synth Wah pedal. "I have my Digitech Bass Synth Wah, basically any Muse cover you've seen me do, I use that pedal." "It's time to bring the funk. Whether you're playing ska, reggae, or funk, the Bass Synth Wah™ is simply the most versatile bass envelope filter pedal on the market, with seven different bass envelope filter types to choose from. Don't just show up to the gig, make the crowds gyrate." I plugged it in, and immediately realized that this was the one Daft Punk had been using. It cost 30 dollars, so I had to have it. Very interesting pedal a lot of variety of sounds are available. This pedal does a lot in a small package. If you want flange, phase, weird noises that will freak people out and make them say "You're making that sound with a guitar? 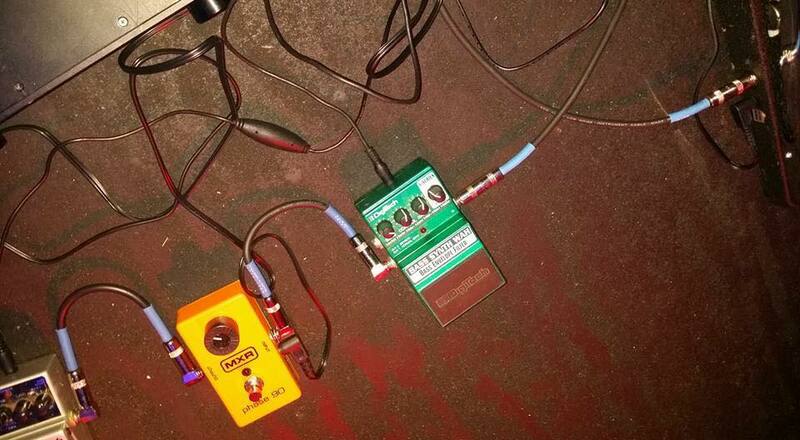 ", then this pedal will do the trick. It's not good with chords on a guitar... being that it was intended for bass, I didn't expect it to be... but if you're looking for an interesting part in a song, this thing can pull through, especially if the song already has a lot of electronic parts. Octaver, synth, filter, envelope, wah - all that in one pedal for little money. Every effect is high quality, really good sounding. You can really get some astonishing tunes with this bad boy. I only use this on the song Pony by Ginuwine. It's capable of much more, but it's perfect, so I keep using it. I love this pedal. It creates a wide variety of sounds and tracks your notes flawlessly. I use this pedal with guitar, and it does not like chords, I will say that. Many knobs on it but I keep it at 1 and mainly flat.. good envelope filter.. work horse.. had it for 10 years.. never fails.. but may be to be retired as it is the only digital pedal left on my board..